Reverend Patrick J. West, of Coney Island, is currently the Pastor of Corpus Christi parish in Woodside, Queens. His past religious service experiences include Pastor positions at St. Peter Claver Church and Our Lady of Solace Church. 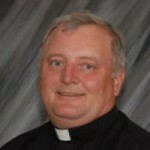 He has also served in the parishes of St. Francis de Sales and Our Lady of Perpetual Help. Father West is a graduate of Tioga Central High School, Cathedral College of the Immaculate Conception and Immaculate Conception Seminary.